Cream retro industrial style cabinet. This cabinet is useful for storing all sorts of things but in particular it is the perfect size for housing vinyl LP's. It would also look pretty amazing with an Lp player on the top also. WALL CUPBOARD, SHELVES, PIGEON HOLES. SWEET LITTLE PAINTED WOODEN. APP 14"W X 14"H X 8"D. STRONG ANG STURDY BUT DOOR. 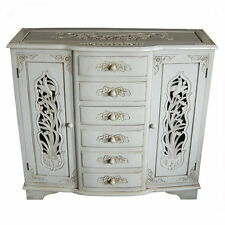 Shabby Chic Wall Cabinet.Would grace any characterful kitchen or bathroom. Wall hanging. Hand painted 'Cream'chalk based paint. Distressed Finish Rustic Cupboard. Rustic Cupboard. Distressed Finish. Wooden Legs. Perfect storage unit for your own leisure. This Park Lane Ivory Traditional Floor Standing Vanity Unit Basin is a functional and elegant choice for any bathroom. Its warm ivory shade makes it perfect to combine with a wide range of colour schemes and décor. It has an elegantly formed rectangular Vitreous China basin which is 800mm wide, so there is plenty of room for washing. The single tap hole is located on the rear edge and is ideal for a monobloc mixer tap. This gloss white ceramic basin also features an overflow outlet for convenience and safety. Beneath the basin, the two doors with raised panel details have traditional-style easy to grasp knobs in satin chrome. The doors feature a soft-close device which ensures that they will never slam shut with a noisy bang. Inside, the two shelves provide plenty of room for storing. This French style Sideboard has been painstakingly hand carved from quality Lindenwood using skills and techniques that date back more than a thousand years. Our Sideboard has six pull out drawers down the middle of the unit and 2 open up storage areas either side. 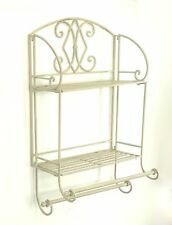 Cream Wall Mounted Plate Rack - Lyon Range. not a parcel firm (they drop things a lot!). I personally take the most pleasure in sourcing and adding new lines to this website. At Flora Furniture, we hope you will agree we have lots of beautiful things! The warm ivory colour of this Park Lane Traditional Floor Standing Vanity Unit Basin makes it ideal to combine with a wide range of bathroom colour schemes and décor. Its compact size and modern stylish look make it a great choice for a smaller space like a second bathroom or cloakroom. The 400mm wide resin basin is hardwearing and will keep its good looks. It has a single tap hole for the installation of a monobloc mixer tap. The simple, elegant style of this vanity unit makes it a practical and popular choice and cleaning is easy as it stands directly on the floor. Beneath the basin, there is a faux drawer handle and under that a useful cupboard with shelves for storing towels or cleaning necessities. The knob and handle are in an attractive traditional style and this vanity . Cookware, Dining & Bar. price :£ 99.53. Candles & Tea Lights. Wall Hangings. Chests of Drawers. Cabinets & Cupboards. Bed Mattresse -Divan Footboard. wall lights. Industrial style small sideboard. 2 Door cupboard with wooden top. Very Industrial design. Height between bottom and top shelf - 25 cm). (Shelf Size approx 35 cm Wide x 16 cm Deep. We now have a vast array of styles to everyone's taste. With it's different textures and materials this piece of furniture is sure to add depth and character to any room as it is very eye catching. Marcella Cabinet,Glass Door/Drawer,Ivory MDFProduct Details. Cookware, Dining & Bar. Bed Mattresse -Divan Footboard. Chests of Drawers. Cabinets & Cupboards. wall lights. ceiling lights & chandliers. Garden & Patio. Marcella Wall Cabinet,Mirror/Ivory MDF,Product Details. Bed Mattresse -Divan Footboard. wall lights. Wall Hangings. Chests of Drawers. Cabinets & Cupboards. ceiling lights & chandliers. Garden & Patio. Marcella Laundry Cabinet,Ivory MDF,Product Details. Garden & Patio. Candles & Tea Lights. Wall Hangings. Chests of Drawers. Cabinets & Cupboards. Bed Mattresse -Divan Footboard. wall lights. This gorgeous cabinet has two storage shelves inside and hooks on the back for wall mounting. This item is finished with distressing to add to the shabby chic look we all love. Shabby Chic Accessories. Beautiful French style bathroom cabinet, with ornate French script on a glass door and handy shelf underneath. Wall mounted design that would add a French country feel to your bathroom. Colour: Cream. Cookware, Dining & Bar. price :£ 72.38. Candles & Tea Lights. Wall Hangings. Chests of Drawers. Cabinets & Cupboards. Bed Mattresse -Divan Footboard. wall lights. Installing the Park Lane Ivory Traditional Toilet Basin Vanity Unit in your bathroom is fast and simple as the entire unit comes fully assembled. With an overall width of 95-cm and a depth of 25-cm this unit sits on the floor and lies flush against the wall to make cleaning easy and to give your bathroom a modern, functional appearance. The warm ivory colour combines with a wide range of bathroom colour schemes, so even if you redecorate it will still match. The vanity unit has a large Vitreous China ceramic basin with a rectangular shape and an elegant form. There is one tap hole suitable for the installation of a monobloc mixer tap, and an overflow outlet for added security when filling the basin. The two vanity unit doors have easy to grasp traditional-style knobs with a satin chrome. French antique style glazed cabinet. In a distressed painted soft cream finish. With 5 shelves and glass door. Colour : Ivory. Garden & Patio. Bed Mattresse -Divan Footboard. Garden & Patio Furniture. Garden Lighting. Candles & Tea Lights. Wall Hangings. Chests of Drawers. The Park Lane Ivory Traditional 2 Door Mirror Cabinet is the ideal addition to any bathroom. The large mirrors on the doors make this cupboard perfect to install above the vanity and basin and it has ample space to keep all your bathroom essentials easily accessible. The cupboard comes completely assembled, so it is ready to install with no complicated instructions to follow. Each door has a simple and functional traditional-style knob which is easy to grasp, and these doors also feature a special soft-close feature which means that they will never close with a bang. This bathroom cabinet is made from high-quality materials, so it will keep is simple good looks for many years to come. Its warm shade of ivory means that it will fit into any colour scheme to . Cream Glazed Display Cabinet. This tall cabinet is finished in a beautiful cream shade with distressing to add to the aged shabby chic look. A beautiful shabby chic cream display cabinet from our elegant Chateau range. French antique style glazed cabinet. With 2 shelves and 2 storage baskets. In a distressed painted soft cream finish. THIS IS A BUY IT NOW FOR A SHABBY CHIC WOODEN 2 PEG COAT RACK, DISTRESSED GREY, MADE FROM OLD LADDER, ALL WAXED. PEG DEPTH 5". When you will receive the call, follow the automated instructions to enter your PIN and confirm your location. Ornate Rococo Style Cupboard. Cabinet with 1 drawer. Drawer size 11 cm x 39 cm x 30 cm. 90 x 65 x 30cm (H x W x D) The feel of the Chateau range is derived from 17th and 18th Century France. Delicate curves, carving and a gorgeous contrast between the natural wood and paint will give your room a wonderfully evocative look.